The company, headquartered in Suffolk, is a large infrastructure group of businesses that provide the full range of utility products and services, including gas, electricity, district heating and CHP, water and waste water, and fiber to the home. 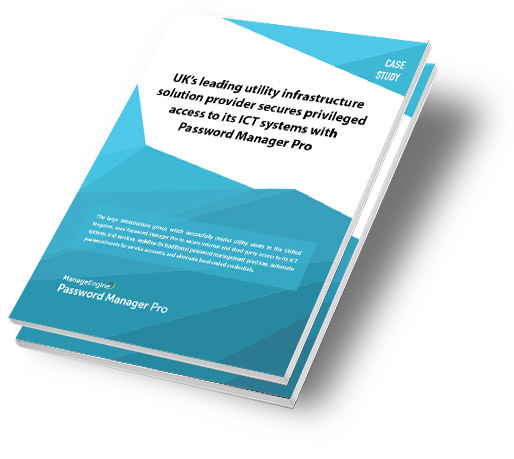 Read about how the firm's ICT team set out to revamp their traditional passwords management practices, getting rid of Excel spreadsheets and moving their privileged accounts to Password Manager Pro's centralized vault in the process. With Password Manager Pro, the team was also able to achieve a regular automated routine for password resets of their local administrative and service accounts. Privileged access, both internal and third-party, to the firm's ICT systems and services is now completely secure and constantly monitored. Just fill-in this form and download the case study. The PDF will open in a new pop-up window.